Visit and test our application here. • The military, law-enforcement agencies, fire departments, and emergency rescue units, for planning operations. By offering a 360° view of the target, Oblivision Online ™ provides accurate information on the dimensions of a structure and its elevation; the size of a structure's windows; the presence of fences, ditches, road obstructions; and much more. • Municipal zoning authorities and inspection agencies, for developing zoning maps and detecting illegal construction. • Electricity Service Providers, for obtaining accurate information about power lines and their elevation above the ground and trees. • Park and forestry services, for obtaining data on fire lines and the height of trees. Oblivision Online ™ is available to aerial photography firms, photogrammetric service providers, and related industry players that aim to extend their added-value product offering. · Is data-source independent. Oblivision Online ™ analyzes any oblique image, new or preexisting, regardless of the settings, position and direction of the camera. You do not need to acquire specially tailored images to take advantage of the capabilities of Oblivision Online ™. You can use images derived from simple, point-and-click handheld cameras to airborne cameras. With Oblivision Online ™, you are not limited to a particular type of visual data. · Is cost-effective, easy to deploy, and simple to operate. Oblivision Online ™ provides a simple image-analysis solution on any standard desktop or laptop computer. All images are available and can be easily reached by any user connected to the Internet. 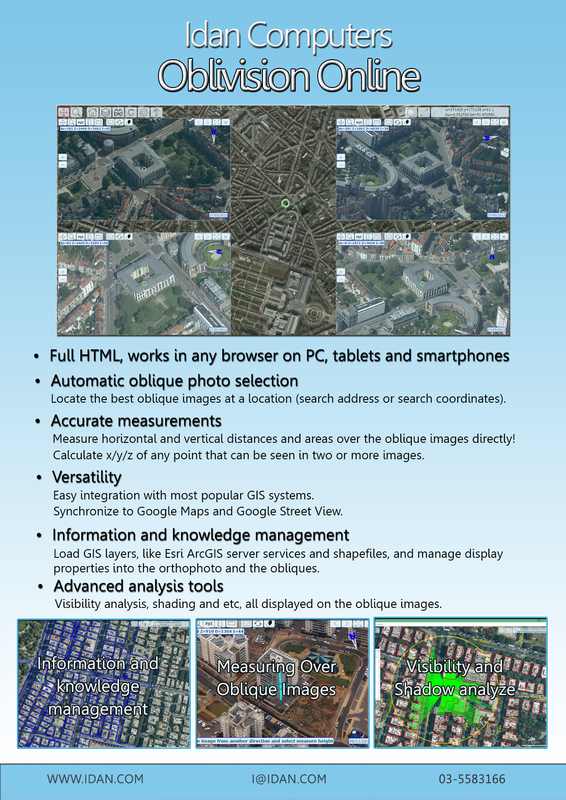 The Oblivision Online ™ Viewer module presents a visual layer composed of an orthophoto, DTM and the geocoded obliques. Selecting a location on the orthophoto, the Viewer will immediately present all corresponding lateral images and will provide the X, Y ,Z world coordinate (the location can be provided also by any external GIS application). When moving the cursor over the orthophoto, Oblivision Online ™ will automatically choose the best oblique photo to be presented (in case more than one oblique image covers the target area). For each location, and for each of the four directions (NE, NW, SE, SW), the best oblique photos (highest resolution at the specific location) are selected. All available photos can be easily accessed by way of the viewer by the end-user via the Viewer (e.g. to see a photos taken at different dates). Vertical and horizontal measuring can be performed on the oblique images. You can calculate the height and width of certain objects and calculate the area of ​​flat and oreintation roofs, which are taken into account the angle and direction of photography. Allow to choose a specific address and focus on it quickly and accurately. In addition, you can display geographical information layers on the orthophoto/oblique images.